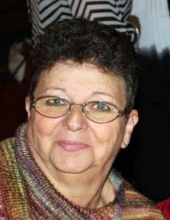 Cheryl A. Topper Paugh, age 65, of Hanover, PA, died Wednesday, February 6, 2019 at Manor Care, Dallastown, PA, following a battle with cancer. Born June 6, 1953 in Gettysburg, PA, she was the daughter of the late William L. and Carmen E. Austin Topper. She was the wife of Donnie Paugh, her husband of 44 years. Cheryl was a 1972 graduate of Catoctin High School. She was employed as a beautician before working for Walmart in Hanover and retired in 2017. She was of the Catholic faith. She enjoyed doing crafts, playing golf and bingo, and traveling to Myrtle Beach and North Carolina. Her favorite times were spent enjoying her family. Surviving, in addition to her husband, are two sons and spouses, Danny and Jackie Paugh of Taneytown, Darren and Christine Paugh of Brunswick; grandchildren, Sierra Kiser, Brandon, Alyson, Darren Jr. and Lexi Paugh; twin brothers and spouses, Nevin and Susan Topper of Charlotte, NC, Kevin and Penny Topper of Fort Worth, TX; brother-in-law, Phil Zimmerman of Rocky Ridge; nine nieces and nephews, including Bradley and Michael Topper and their families, Lindsay Tokar and family, Alison Gillen and family; special great-nieces and nephews; three aunts, Betty Fleagle, Betty Austin and Marty Austin; and devoted cousin, Kim Jenkins and husband Gordon. She will be remembered by her special friends, Steve and Jill Woelfel and John and Brenda Woelfel. She was predeceased by a brother, Tom Topper and wife Sharon; and sister-in-law, Donna Zimmerman. The family will receive friends at Hartzler Funeral Home, 404 S. Main St., Woodsboro on Sunday, February 10 from 2 to 4 and 6 to 8 p.m. followed by a brief prayer service at 8 p.m. Father Paul Thomas will officiate. In lieu of flowers, memorial donations may be made to the American Cancer Society, 1393 Progress Way #908, Eldersburg, MD 21784, or to a charity of one's choice. To send flowers or a remembrance gift to the family of Cheryl A. Paugh, please visit our Tribute Store. "Email Address" would like to share the life celebration of Cheryl A. Paugh. Click on the "link" to go to share a favorite memory or leave a condolence message for the family.